I have been reading the government’s White Paper on Planning, published at the beginning of the week. Much of the interest in this document has focused, rightly, on the government’s intention to sub out difficult infrastructural works (i.e. new nukes, new runways) to an independent commission. Environmentalists have been jumping up and down saying this is going to make big planning decisions unaccountable, but I am not sure it will make that much difference because the government always gets its way in any event. What they are hoping to do is to make the process a little quicker. I am more interested in the other end of the spectrum, how the government intends to streamline the processing of domestic planning applications. It looks like it needs some attention because the number of applications has mushroomed in recent years, due in no small part to the penal rates of stamp duty being charged for moving house, which causes everyone to start extending instead. However the White Paper sandwich has an awful lot of bread and very little meat and, once you’ve dusted off the pages and pages of good intentions, what you are left with in terms of concrete proposals is not much more than guesswork. Chapter 9 is where it gets written up and it all hinges on the future of Permitted Development Rights. This is a system that has existed since planning controls on domestic development were first introduced in 1948 and it allows certain minor works to be carried out without the need for planning permission. Each house comes with its own PD Rights but once these have been used up, any additional development requires planning permission. The intention expressed in the White Paper is to replace the PD Rights system as it now exists with Impact Assessments. No or low impact development – and by impact we are talking principally about the effect on the neighbours — will be permitted, whilst high impact developments will require planning permission. Reads well on the page but the problem that immediately sticks out about this proposal is that impact is subjective. Who is going to decide the difference between low and high impact? Hmm, it’s a difficult one. But if you think about it for a couple of minutes and look at Labour’s past record on housing matters (think Home Information Packs here, not to mention its various competent person schemes aimed at streamlining the building regs), you can sort of figure out where this is all heading. Answer: Impact Assessors. So I can see the future going something like this. If you want to make changes to your home you will have to first contact an Impact Assessor. They will determine whether you need to apply for planning permission. They will also levy from you an Impact Fee for environmental improvements to your neighbourhood — on the basis that a new bedroom is another school place or a hospital bed. 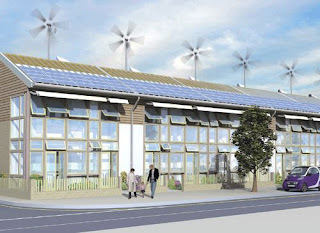 And then you will be required to carry out additional eco-improvements to your home. By paying these fees and committing yourself to undertake the extra works, you will buy yourself a permit to develop. If you go ahead illegally, you risk fines (having been snitched up by nosey neighbours), not to mention difficulties selling your home when the time comes. From the government’s point of view, this will streamline the planning process and vastly reduce the number of applications clogging up the system. Instead of having to hire expensive graduates to staff planning departments, school leavers will be able to train as Impact Assessors on a three-day intensive, get their competency badge and off they go, just like we are seeing with Domestic Energy Assessors at the moment. The assessments will be done by feeding measurements and checkbox answers into a laptop, which ordinary mortals won’t have a hope of understanding. And will therefore be unchallengable. It all sounds horribly 1984 but the strange thing is it sort of makes sense and I am not sure it’s actually any worse than what happens already. In fact, it makes rather more sense than the current proposal to have Energy Performance Certificates every time a house is sold, as an impact assessment would be made prior to building work, which is the best time to make changes to the house. It could be a transformational tool for upgrading the existing housing stock, but it’s more likely to be construed as yet another stealth tax — which it is — and will therefore be hugely unpopular. Maybe the government will be able to use its new independent planning commission to force this new measure through! Maybe I had, but then all this Urban Taskforce stuff came out about the importance of density, and unlocking the formula for successful walking towns. You have to cram lots of things into a small area to make them tick, without having to drive endless miles to samey shopping malls a l’Americana. Yeah, it made sense, but it was all at odds with being able to build just anywhere you wanted to. On the other hand, not everyone wants to live in a 21st century Italian hill town. Some people like gardens and cars and space. Why should densely packed new towns be the only form of development? The news that Hanson is to be taken out by Heidelberg Cement in an £8billion deal brings to a close the British ownership of its building materials sector. Whilst the City scribes have been using the takeover as an excuse to rerun the colourful history of Hanson Trust, they have largely ignored the fact that a whole sector of our industry has disappeared from our stock market in less than ten years. Simultaneously, the much smaller Baggeridge Brick is being taken over by the Austrian brick giant Weinerberger in an acquisition worth just £87million. Here follows a list of what went where. ARC: part of Hanson, which includes Hanson Brick (the old London Brick Company, makers of the LBC) and Thermalite and the old Marshall’s Floors business. Now Hanson is about to be taken over, see above. On this coming Saturday, May 19th, I am set to appear at a Conference called All Planned Out, to be held in London’s Building Centre. 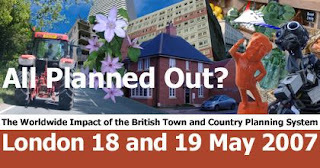 It’s been organised principally by Ian Abley of Audacity and it’s set to explore the tangled web woven between the housebuilders and the planners. It’s a hot topic this week, as Gordon Brown has just gone on record as saying he wants to make housing affordability a key plank of his administration’s policies. Good luck, Gordon. Audacity’s line on all this is that we can build our way out of this problem. House prices too high? Let’s bung up 500,000 a year for ten years. Sorted. Brown seems to agree but, being a politician, presents a very watered-down version with just five new Eco Towns instead. But the Irish experience suggests that a mass housebuilding programme may not deliver the goal of affordable house prices. When I first became aware of the Irish housebuilding boom, six or seven years ago, I was just amazed to find out that they were building 50,000 new homes a year in the Republic. On a per-head-of-population basis, this was approaching five times the rate the UK was achieving at the time. Did this ease the upward pressure on house prices in Ireland? Did it heck. Since then, they have trebled. Last year, there were apparently 90,000 housing starts in Ireland, just an incredible number in a country with a recorded population of no more than 4.2 million (though it may well, in reality, be much higher than this now). At long last, supply appears to be outstripping demand and lots of these new homes are currently unoccupied, bought as investments or as holiday lets, whilst lots more are rented out to East European construction workers, employed building yet more homes. And still Irish house prices keep going up. It looks like a classic bubble, a speculator’s binge fest, but people have been saying that for years and the bubble just refuses to burst. Does the Irish example have any relevance to the UK? Our equivalent total to Ireland’s 90,000 new housing starts in 2006 would be no less than 1,200,000, roughly seven times more than we actually achieved. It makes even Audacity’s rallying cry of 500,000 a year look puny in comparison. You would need a microscope to even see Gordon Brown’s five Eco Cities. And yet, even this enormous house building boom hasn’t delivered affordable housing to the young of Ireland. What’s going on there? Maybe, we’ll be able to find out this Saturday. In the meantime, mug up via an article on Wikipedia entitled the Irish Property Bubble. Just back from Glasgow where I helped deliver the seminars at this year’s Homebuilding & Renovating Scottish show. Very well attended and a very lively audience. I learned quite a bit, as ever, and in particular I found out about a new breed of planner, the Planning Gain Officer. In the past few years, it has become customary for local councils to start “requesting” payments from selfbuilders and small developers by way of contribution to the community. It’s been happening on big sites for decades and apparently the Americans are past masters at this sort of thing as well. But it’s still relatively new on small development sites and as yet it’s been piecemeal. Some councils don’t bother, others charge a little and a few charge a lot, like £20k or so. I’d not heard of it being applied in Scotland before, but that’s all changed now. Back in 2005, Aberdeen City Council hit on the wheeze of appointing a Planning Gain Officer to fill a much needed gap for this Council, consistent with efficient government principles. You bet. The job description basically involves dreaming up reasons to extort money from private developers and selfbuilders. Initially, the council didn’t expect the income to cover the outlay on funding the post — which might seem just a little inconsistent with the principles of efficient government — but they needn’t have worried. It was set to become a goldmine for the local authority and the guy is now in demand right across Scotland, lecturing all the other authorities about how to go about it. By way of example, I came across one guy in his sixties who was applying to convert his workshop into a house. In order to do this, his council were demanding £3,000 to go towards the local primary school, £2,000 for the secondary school and £1,700 for work on a new railway. Coupled with a bizarre demand by his building inspector to install a sprinkler system in his two storey, two bedroomed house, he reckoned he would be out of pocket by £15,000 or more, just to get his project off the ground. After reading your blogs and general ranting on the stupidity of HIPS, I still have never seen anything mentioned on the efficiency on curtains as an insulating material. On our old cottage, with part double-glazing, part older character windows, we have home-made blinds and combined with curtains which are lined and inter-lined. I would suggest the rating must be equal to or better than a modern double glazed window. The house can warm up more during the day through the single sheet of glass, and then retain that heat when the blinds and curtains are closed after sunset. Also the house has 2ft wide solid wall construction. Might this be more or less efficient than cavity wall + insulation? Does anyone know? I'd like to see government helicopters mapping the city at night with their heat photographing cameras and targeting the few really bad leaking buildings (and cannabis dryers!) directly and leaving the rest of us alone, instead of stimulating another raft of inspectors. I suspect that's because no one has ever measured them. I think a lot would depend on the degree of draft-proofing but in theory a single sheet of glass should admit more heat during the day and a thick drape would act something like a second sheet of glass at night. But equal to, or better than? Who could say? Also the house has 2ft wide solid wall construction. Might this be more or less efficient than cavity wall + insulation? Measurements have been taken on solid wall materials. Generally solid stone performs very poorly, from a conduction point of view. You need something like a 3ft to 4ft thickness to achieve the equivalence of a modern cavity wall. And if it gets wet, it's almost useless. Well that would be really popular, wouldn't it! Can you imagine getting a heating ticket from a flying thermographic camera! Maybe one day soon, they'll be able to do it from satellites. Funny what turns up in the post of a morn. I’ve managed to get myself on the mailing list of a magazine called KBB Space, which is all about upmarket Kitchens, Bedrooms and Bathrooms, hence the KBB. Flicking through it over my porridge, I came across this ad, which made me laugh, because the two images and the linking text are just off the wall. I know Kaldewei baths are good but this good? 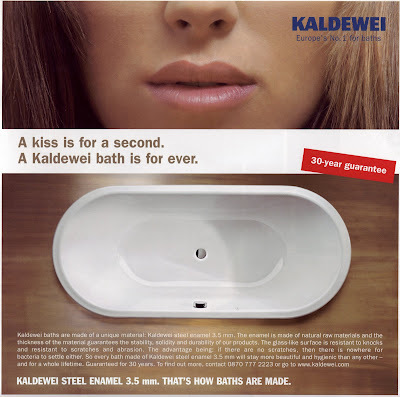 As an aside, I knew almost nothing about Kaldewei as a company but wasn’t surprised to learn from their website that they are yet another family owned German outfit. They started in enamelling in 1918 and moved onto baths in 1928. They remain very specialised, just doing baths, shower trays and a bit of water heating equipment. How very different from the Anglo-Saxon business models.